Well, after the “white Dauphine” post from yesterday and the overwhelming response that the picture is most definitely Louis XVI‘s younger sister the Princesse Elisabeth, aka Madame Elisabeth, I thought we’d earned a closer look at the the sister-in-law supreme. (Hey, she endured the Varennes flight, recapture and return, as well as the terror in the Tower and met the eventual guillotine after Louis and Antoinette’s death didn’t seem enough to quell the blood-thristy public. But hey, instead of ME calling Madame Elisabeth a saint, why not use some first-hand sources? I lifted these observations from the Memoirs of Madame Campan (free download on iBooks thanks to Project Gutenberg!) Quotes that are not hers have been annotated. 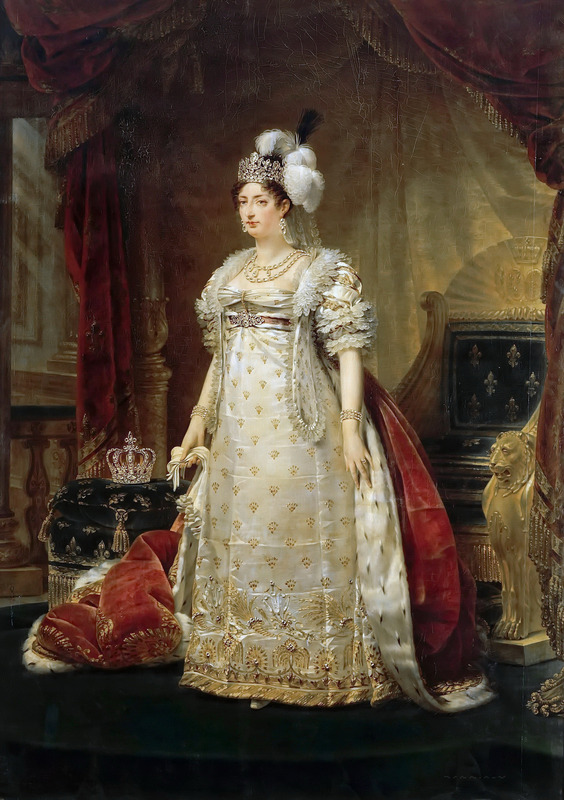 Madame Elisabeth was one of those rare personages only seen at distant intervals during the course of ages; she set an example of steadfast piety in the palace of kings, she lived amid her family the favourite of all and the admiration of the world. When I [first came to] Versailles Madame Elisabeth was twenty-two years of age. Her plump figure and pretty pink colour must have attracted notice…her air of calmness and contentment even more [alluring] than her beauty. She was fond of billiards, and her elegance and courage in riding were remarkable. But she never allowed these amusements to interfere with her religious observances. Her wish to take the veil at St. Cyr was much talked of, but the King was too fond of his sister to endure the separation. There were also rumours of a marriage between Madame Elisabeth and the Emperor Joseph. The Queen was sincerely attached to her brother, and loved her sister-in-law most tenderly; she ardently desired this marriage as a means of raising the Princess to one of the first thrones in Europe, and as a possible means of turning the Emperor from his innovations. She had been very carefully educated, had talent in music and painting, spoke Italian and a little Latin, and understood mathematics…her last moments were worthy of her courage and virtue. —D’HEZECQUES’s “Recollections,” pp. 72-75. Another interesting footnote: when the monarchy was dissolved for the second time, Marie Terese was actually Queen of France for about half an hour: the time elapsed between her father-in-law/uncle’s abdication and her husband’s signing of the same papers relinquishing the crown. This entry was posted in court and social and tagged Counts and Dukes of Angoulême, court at versailles, Duchesse d'Angouleme, iBooks, King, Louis, Louis XVI of France, Madame Elisabeth, Madame Royale, marie Antoinette, marie antoinette family, Marie Terese, Princesse Elisabeth. Bookmark the permalink. she was guillotine in 1794 at age 30 just because she defended her brother,the king. Those were the revolutionaries. From visiting her place ,she seems to be a very modern intelligent women, maybe ahead of her times. Good writings by the way.